Warrington were stunned at home by Salford to lose just their third Super League game of the season. The Red Devils raced into an early lead through Kris Welham and Joey Lussick tries before a brief response came when Blake Austin crossed for the Wire. But Salford continued to dominate as Daniel Murray and Rob Lui touched down and Krisnan Inu kicked 12 points to put them 28-6 up at the break. Jake Bibby made absolutely sure by crossing just after half-time. There was still time for Bryson Goodwin to grab a consolation try. Warrington have started the season in superb form but were blown away in an opening period that Salford utterly dominated. When some tricky play from Austin got them on the scoreboard, it seemed as though it could be a trigger for Steve Price's side to click into their normal selves. But it was not so, with Murray responding for the Red Devils to snuff out any threat and set the basis for a strong defensive effort in the second half. 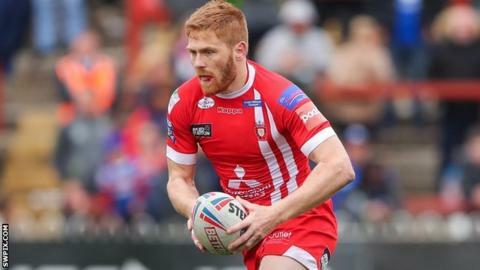 Welham was sent to the sin bin with 15 minutes to play, but Warrington could not make the man advantage pay and slipped to a defeat that leaves them four points behind leaders St Helens, ahead of the Easter Monday trip to Hull KR. Going into Monday's home game with struggling Wigan, Salford are seventh, having won five of their 11 games this season. Warrington coach Steve Price: "Our intent at the start of the game was disappointing and to concede 38 points was disappointing. We just weren't at the races. "We've been really good as a club to responding to losses over the last 18 months so we've got a bit of work to do. "We've got two days to lick our wounds and get back to training on Sunday and get down to Hull KR. So in our case we're happy for the short turnaround." Salford coach Ian Watson: "The boys did an outstanding job. We were really clinical. We know we can go to a certain level and we have shown our processes work. We have just got to believe in ourselves a little more. "Our resilience to defend our goalline in the early stages set us up and gave us the platform to win. We've been good for quite a while and I know when you are losing it's not great but we have been improving and have got tidier at certain things. "We've got to believe in what we're doing. Monday is another big game, a different challenge. And we need to back it up with a win to set us up for the rest of the season." Warrington: Ratchford, Goodwin, Atkins, Charnley, Austin, Hill, D Clark, Cooper, Currie, Hughes, Patton, Livett, Westwood. Interchanges: Murdoch-Masila, J Clark, Philbin, Davis. Salford: Evalds, Welham, Bibby, Lui, Dudson, Jones, Griffin, Lussick, Walker, Burke, Olpherts, Inu, Hastings. Interchanges: Wood, McCarthy, Nakubuwai, Murray.